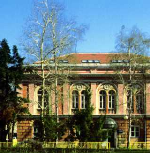 The University of Tuzla is a public higher education institution which was established in 1976. In 2001 the University of Tuzla became the first integrated university in Bosnia and Herzegovina. The teaching is organized in three cycles, in line with the Bologna Process, and the university offers more than 80 study programs in bachelor, master’s and doctoral studies in 12 faculties and Academy of Performing Arts. Currently, there are around 16.000 students studying at the University of Tuzla in all cycles of studies. The university employs 720 academic and administrative staff members. The University of Tuzla has signed over 40 cooperation agreements with the universities worldwide and is focused on developing relationships with the academic community and strengthening the international process. The university has participated in a number of international mobility and research projects, such as Erasmus Mundus, Ceepus,Tempus, Mevlana, FP6, FP 7, IPA and many more.